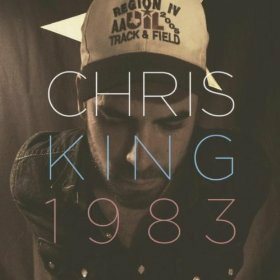 I've never seen Chris King play live. I didn't even hear of him until I started to see quite a bit of buzz surrounding his debut album, 1983 (I assume its a reference to his birth year, thanks for making me feel old buddy). The whole album is a solid hunk of country goodness. The songwriting is strong throughout. My personal favorites are "Antler Ballroom" & "Man Enough" which features the inimitable vocal stylings of Jamie Wilson (best known for her work with The Trishas & on the Turnpike Troubadours' Goodbye Normal Street). King sings in a distinctive tenor that strikes a sure-footed balance between youth and old-soul experience, making his voice the perfect vehicle for exploration of a life caught in that dichotomy. Though he's of the Texas/Red Dirt scene, so to speak, his presentation bears little resemblance to any stereotypical "sound" you expect when you read that classification. His music is catchy and accessible, yet layered and soulful. So here's a big "Thank You" to Chris King for making a true country album & here's to many years of continued success. You can purchase 1983 at Lonestar Music, Amazon, CD Baby or iTunes.